Fathom Events, TCM and Universal Pictures present To Kill a Mockingbird, coming to cinemas for a special two-day event! Experience one of the most significant milestones in film history like never before with To Kill a Mockingbird. 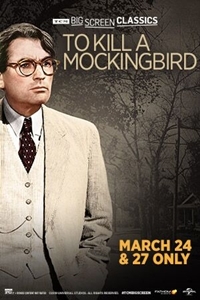 Screen legend Gregory Peck stars as courageous Southern lawyer Atticus Finch - the Academy Award®-winning performance hailed by the American Film Institute as the Greatest Movie Hero of All Time. Based on Harper Lee's Pulitzer Prize-winning novel about innocence, strength and conviction and nominated for 8 Academy Awards®, watch it and remember why "it's a sin to kill a mockingbird." The event includes exclusive insight from Turner Classic Movies.